What began as a bipartisan effort to distribute $5 billion in federal funds, and keep some Illinois programs afloat despite a budget stalemate, appeared Tuesday to be headed for a veto by Republican Gov. Bruce Rauner amid a continuing financing feud with Democrats in the General Assembly. The plan before the House to cut loose available federal funding — providing nutrition for low-income women and babies and energy-bill assistance for the poor — got an overhaul. Democratic House Speaker Michael Madigan pumped into the Senate-approved initiative an additional $1.4 billion, including about $750 million in state spending authority. The state money is a deal-breaking "poison pill" inviting a total veto, Rauner's office announced hours before a House committee endorsed the idea on 10-1 vote, with four GOP members voting "present" in protest. The vote, following a 90-minute hearing during which Democrats and Republicans traded grievances from a summer of stonewalling and inaction, sends the legislation to the House floor where lawmakers expect to vote Wednesday. More than $4.8 billion available from Washington for social services, emergency aid and more would have been included in a state budget slated to take effect July 1. But after both the first-year governor and legislative Democrats produced budgets that did not balance, the deadlock ensued. 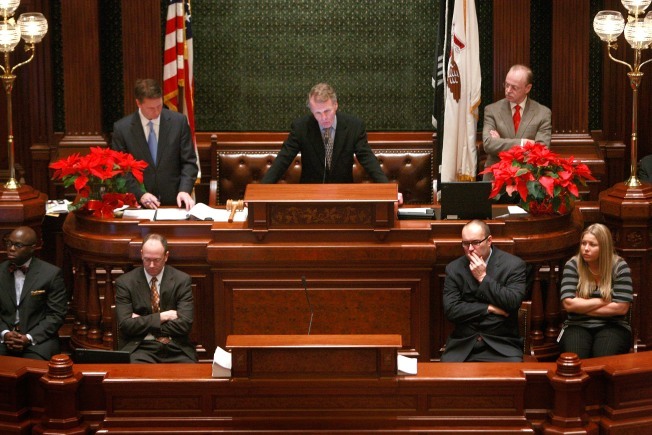 The Senate approved authorization to spend the federal money last week with Rauner backing. Now Republicans are beside themselves as to why Madigan would pass up the chance to get some money flowing even though there's no fiscal plan. "Don't you think it would be better to move forward on the stuff that we can agree on?" GOP Rep. C.D. Davidsmeyer of Jacksonville asked. "There's $4.8 billion that's already ready for the governor to sign." If the House OKs the amended legislation, it must return to the Senate for concurrence on the changes, delaying action for at least a week even without the threatened Rauner veto. Democrats said the state money is crucial too, and pointed out that about $300 million in federal emergency-preparedness money, left out of the Senate version, was requested by Rauner's office. The majority of the general state spending — $480 million — would go to child care for working parents. Rauner severely restricted the service among emergency budget cuts this summer. In Chicago Tuesday, a bipartisan legislative panel that governs such rule-changes failed to nix Rauner's action, which the Department of Human Services says eliminates nine in 10 families that had previously qualified for help. Republican Rep. Mike Tryon of Crystal Lake said Rauner had no choice and needs "tools to manage through the crisis." Chicago child care provide Zuli Turner said the beneficiaries are the "working poor," those who have jobs but will have to choose among rent, food and child care without state help.